Show Information has been updated! A Schedule of Events has been added so you can plan your day! Please have a look for times. 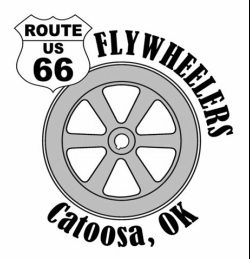 The Route 66 Flywheelers got their beginnings in 1991, when Catoosa Mayor, Curtis Conley invited a local engine collector to contact some fellow engine enthusiasts and set up a display at the City’s Independence Day Festival, Liberty Fest. There was a parade down the city’s main thoroughfare, a band in the gazebo, and a small group of engine people. The display seemed to be well received by the people of Catoosa and the group was invited back the next year. The gathering grew steadily over the next few years, still being just a group of, mostly local, folks with kindred spirits. In the mid 1990s, Catoosa opted to move Liberty Fest to Rogers Point at Route 66 and the Verdigris River. This was a good move for the city, as there was more space, better facilities for the amount of people, and a place for a really great firework display. This sort of left the engine people being a small group in a large show. Once again Mayor Conley to the rescue. The third Saturday and Sunday of October was proclaimed Catoosa’s Fall Festival. The first Fall Festival was engines and an evening street dance with live music held at the city park between new 66 and Historic Route 66 (site of the original Liberty Fest). This being October and the evening temperatures hovering near the forty degree mark, the dance was a one year event. The next year was a first that the group felt we should advertise. Fliers were printed, a local radio station did some advertising and the show grew. With the growth came a need for all things we associate with engine shows (buttons, plaques, and advertising). In the past the exhibitors had always picked up these expenses, as there was no club, no dues, and no money (until then there were no buttons, plaques and limited advertising). In 1997 a member took it upon himself to start supplying the show with buttons at his own expense. While our group had always fed our exhibitors, spectators started wanting to eat with us and discuss engines. They always offered to pay, but the money was always refused. We first advertised nationally in 1998. In filling out the paperwork, the blank, club name, appeared. There had never been a “club”, let alone a club name. It had always just been the Catoosa show. That night the Route 66 Flywheeler “Oklahoma’s non-club” was born. That year there was an article written and published, fliers were printed and the show grew more. A lot! The food supply at the show was starting to look a little short, with all that wanted to eat. The problem was handled by everyone pitching in and donating more. People were still asking, “How much for supper?” With the added cost of success, we reluctantly set out a donation jar. Wow! We had no idea how much people appreciated us. We had never charged anything for exhibiting, flea market spaces or admission, and with the generosity of our people, we should never have to, we have grown steadily year after year, with 2003 being beyond our wildest expectations. Forty seven registered exhibitors around 150 engines, as well as garden tractors, mowers and agricultural exhibits, plus vendors. We are primarily an engine show, but always have a few tractors and usually a great display of cars, trucks and motorcycles. In 2005 we had our first antique tractor pulls. It was across the street from the gas engine & tractor show and once again it grew. Then in 2007 the club decided to finally move to Rogers Point Park so we could have the tractor pulls and gas engines all in one place. Mayor Rita Lamkin to the rescue and made it a city event. The show grew again and thanks to Mayor Rita Lamkin in 2008 it will be an annual show and will be sponsored by the City of Catoosa, OK. The show will also be three days Friday, Saturday, & Sunday. Our thanks to the City Of Catoosa and with their help the show will be here for years to come.